The famous historic Old Town Key West waterfront on the gulf side of the island and the original lower Duval Street area, encompasses this district. Here the founding fathers and mothers of the late 1800's built the first shipping docks and warehouses, restaurants and grand homes, that stand today as one of the largest and most impressive collection of turn-of-the-century architecture. From larger Greek Revival Victorians to charming shot gun cottages, many of these alluring structures have been restored and renovated to stand in their gleaming glory and some are available to rent. Today this district includes famous waterfront restaurants and bars, retail stores, museums, fishing and sailing charters, a large variety of historic homes, and Mallory Square. Walk to the Mallory Square Sunset Celebration in 5 to 10 minutes. This tiny section of Key West is the "island urban" area. When you stay in this tiny district it's amazing how much there is to see on each street. The mid-section of famous Duval Street in Old Town Key West grew up as the central downtown area. The original city infrastructure was built here to create a diverse array of shopping, offices, entertainment, restaurants, bars, hotels, and churches, and these features are still offered in a modernized mode. Just around the corners off either side of Duval Street an impressive array of historic Victorian and cottage style residences stand, and some are available to rent. From this area you can walk to the Mallory Square Sunset Celebration in 10 to 15 minutes. This tiny district has grown to be known as the "Uptown of Old Town Key West." This small area offers an exceptional array of excellent restaurants, beautiful boutiques, art and furniture galleries, and is close to South Beach and the Southernmost Point of the United States. It is noteworthy that in 1876, one of our most prominent Cuban immigrants, Eduardo H. Gato, built a stunning marble Cigar Factory in this neighborhood to create the city's largest producing hand-rolled cigar factory, and today this fully restored building houses local government. As the cigar industry boomed in the 19th century, so did the immediate need for neighborhood housing. Cottages and Victorian homes sprang up to form the Upper Duval Gato neighborhood that includes Louisa, Catherine, Amelia, and Virginia Streets, and today has grown into the "elegant area of Duval." Some of these beautiful residences are available to rent. From this area you can walk to the Mallory Square Sunset Celebration in 15 to 20 minutes. Bahama Village is a distinctly unique historic district where Bahamians moved from the Bahamas to settle in Key West in late 1800's. Bordered by Whitehead, Louisa, Fort, and Angela streets, some folks consider Bahama Village the last enclave of "the real Key West." Strolling village streets is reminiscent of the Bahamas with clapboard "shot gun" houses painted white, Caribbean blue, and canary yellow. But an inevitable gentrification of this tiny district has brought renovation and restoration to of many of the historic buildings making way for hip and ethnic restaurants, boutique shops, and beautifully restored charming cottage style homes on some of the streets. Now the home of a small thriving African-American community, the village is a treasured island district that is working hard to retain its distinct cultural heritage. A few renovated cottage homes, mostly on parameter of the village, are now available as vacation rentals. Bordering the downtown shopping area of Old Town Key West, you can walk to the Mallory Square Sunset Celebration in 5 to 10 minutes. The residential district of 'Truman Annex' is an upscale gated island neighborhood that was renamed for President Harry Truman who spent his winters in at the Annex at his home known as 'The Little White House.' Located on Front Street, the former president's stately residence is now the Harry S. Truman Little White House Museum. Original military grounds encompassing over 100 acres were redesigned and renovated by a private developer in the 1990's. Now grounds throughout the Truman Annex are park-like, exquisitely landscaped and manicured to picturesque perfection, making it a delightful neighborhood to walk and bicycle. White picket fences, freshly clipped hedges, green grounds and fountains create an impressive back drop for a stroll to town. Original military officer's homes, now renovated as large private luxury mansions, display both Italian and Greek Revival architectural styles. Towards the south end of the Annex, small new row town homes with tin roofs and sitting porches were built in the classic Southern Cottage style. Just out the gate towards the ocean is Forty Zachary Taylor, now a State Park with one of the nicest beaches on the island. From here you are just a 5 to 10 minute walk to Duval Street, the center of downtown Old Town Key West, and the Mallory Square Sunset Celebration. The center district of Old Town Key West is the "residential heart." Historic streets are lined with more and more wooden Victorian homes and cottages built by early ship builders and men of wealth. Some were even built in the Bahamas and brought by boat to Key West. A hand full of side streets intersect with little lanes with names like Love Lane, Nassau Lane, Poorhouse Lane, and Catholic Lane - each a reflection of a more innocent yesteryear. 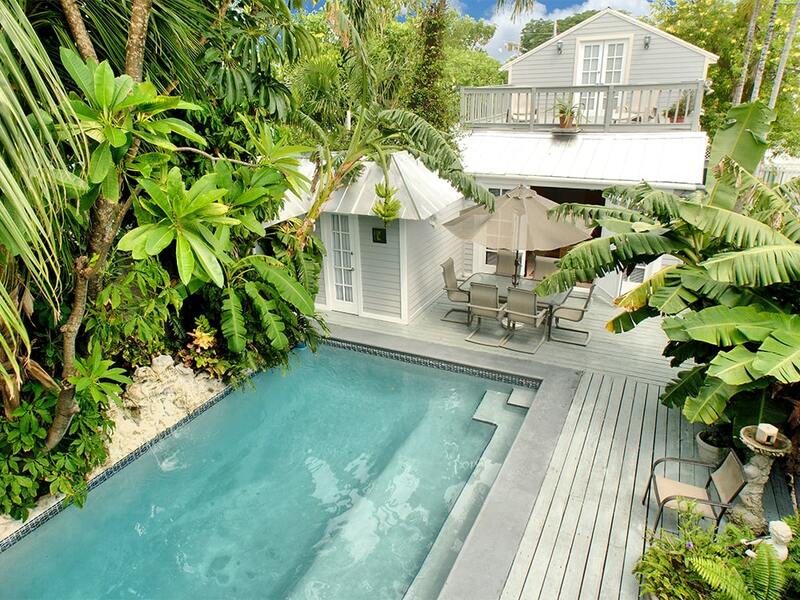 Earnest Hemmingway lived in this neighborhood and his home is now a museum open to the public. There are a variety of historic houses of worship throughout the area, and in the "center of the heart" of Old Town Key West is the historic graveyard with the important USS Maine monument. The Heart of Old Town also houses a select number of restored Victorian homes of wealth that are now offered as private vacation rental estates or bed and breakfast accommodations. From this area you can walk to Duval Street in 5 to 20 minutes. The signature building for this section of Key West is the historic 1920's Henry Flagler Hotel. Flagler developed the overseas railway that extended all the way from the mainland of Florida to Key West with his luxurious ocean front building as a prominent destination. 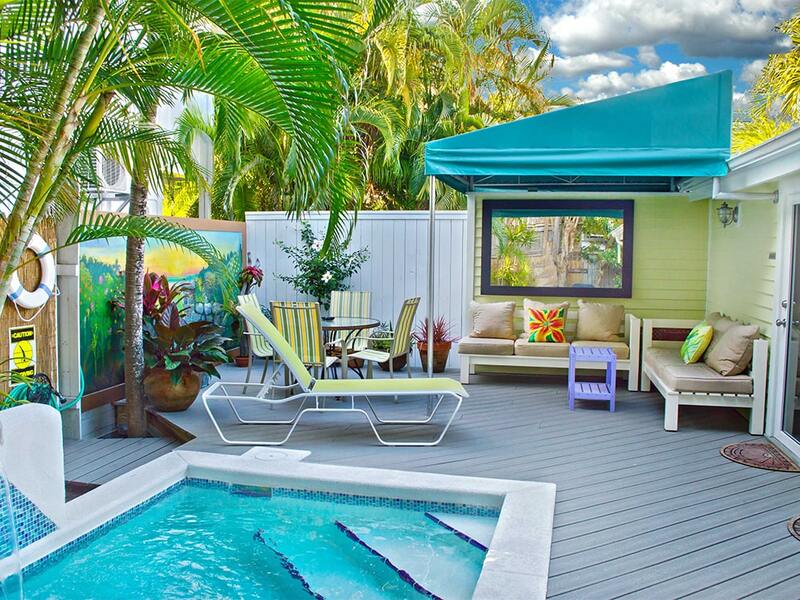 Now named the Casa Marina, this small exclusive residential district has grown into one of the most sought after neighborhoods in Old Town Key West. In the mid 1900's this area was considered the "country side" of the island, and the modern day result leaves a legacy of outstanding turn-of-the-century, mid-century and modern architecture with beautiful gardens and more yard space than is typically found in the other residential districts in Old Town Key West. This a quiet residential area, close to the Atlantic Ocean, beach front restaurants, the Southernmost Point of the United States, the South end of Duval Street, and the White Street gallery and shopping area. There are a few select homes available to rent in this area, mostly as monthly or seasonal rentals only. From this area you are a 3 to 5 minute walk to the beach and a 20 minute walk to Duval Street. This exclusive residential area of Old Town Key West is really an extension of the Old Town Historic Seaport District where the harbor 'rounds the bend.' It was originally developed as a suburban neighborhood in the early 1900's and has a distinctively gracious and private feel with wider tree lined streets and larger yards. There is less commercial development than the seaport side of White Street and the center of Old Town. Yet, the Meadows is flanked by White Street that offers many locally favorite restaurants, art galleries, bakeries, and shops. While many of the Meadow's residents live in Key West year around, there are some homes available for rent mostly to seasonal guests. From here you can walk to the Historic Seaport in 5 to 10 minutes and walk to Duval Street in 20 minutes. Flowing from the east side of White Street to Leon Street, and the south side of Truman Avenue to Flagler Street, this area of Key West encompasses Bayview Park, one of the island's largest green zones that offers tennis courts and a large gazebo mostly used to stage small local island gatherings. White Street, referred to by many as "The Local's Duval," offers a culturally diverse assortment of locally favorite businesses including restaurants, bakeries, Cuban Coffee Shops, consignment shops, tile stores, small grocery stores, and art galleries. A new prominent variety of art galleries now deems it the "White Street Gallery District", and because the former home of Tennessee Williams is in this neighborhood this district is also his namesake. 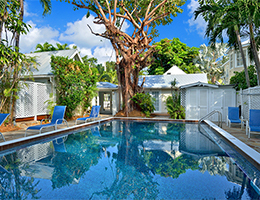 The architecture presents an eclectic variety of mid 1900's to mid 20th century architecture to create an authentic Key West neighborhood ambience. While it is mostly the home of full time residents, it's central yet "off-the-beaten-path" location has made it a favorite of seasonal renters, and a very select few properties are available to rent as short term vacation rentals. From here you can walk to the beach in 5 minutes and to Duval Street in 20 to 25 minutes. This area of Key West is often referred to as the beachside neighborhood due to the close proximity to the southern shore of the island. It runs roughly from Flagler Street to the southern shore and White Street to Bertha Street, and then winds along South Roosevelt Blvd. This part of the island feels like a beach town neighborhood with light ocean breezes, and it's not unusual to see folks walking or biking to Higgs or Smathers Beach in their bathing suits with towel and cooler under arm. A paved biking and walking path stretches along the southern shore dotted with parks and food and water sport concessions making it easy to stroll or bike. There are two Civil War Forts along the waterfront, West Martello near Higgs Beach and East Martello a little further down near Smathers Beach. Residential architecture in this area consists mostly of renovated mid-century homes, a few streets off the beach, and some modern estate residences closer to the beach. Along the water are a few luxury condominium complexes. The neighborhood is a mixture of year around and seasonal residences. There a few homes available to rent, and a select few exclusive condominiums are also available as short term vacation rentals. The paved beach path makes it fun and easy to ride a bike to downtown Old Town Key West in 10 to 15 minutes. Since the island is flat, it is also a nice easy 30 minute walk with lots to see along the way. Sandwiched between the White Street Gallery district and New Town Key West, the blurred boundaries of this section are generally described as Leon to White streets, and North Roosevelt Blvd., to Flagler Ave. Mid-Town Key West is decisively residential, created from landfill in the 1940's and 1950's to allow for early suburban development. Architecture mostly reflects the style of modest mid-century homes with nice big yards. Many local families live in this home town neighborhood. But with sky rocketing property values in Key West since the late1990's, these homes too are creatively renovated into unique island dream homes with lush tropical landscaping and swimming pools. This little "off-the-beaten-path" neighborhood is so close to the beach, White Street, and New Town Key West, many consider it the perfect location. An occasional home in this neighborhood is available for rent as a seasonal vacation rental. It takes about 20 minutes to bike to Upper Duval. While most people don't walk from here to town, it goes quicker than you would imagine and there is much to see along the way. When viewed in entirety, most of the island of Key West is comprised of New Town, and as with Mid-Town, this real estate was originally created from landfill. Within the boundaries of this area are three distinct areas. First Street to Kennedy Drive, and then Riviera Drive to Patterson Avenue, is primarily a residential area for local full time Key West residents. Many of our children and grand children are growing up in this neighborhood. It is within walking distance to Key West High School, one of our main elementary schools, the ball stadium and the skate board park. As with mid-town, many local families are now turning their homes into major dream homes. Along the extreme north of the island along North Roosevelt Blvd. you will find "Anywhere USA," with shopping centers, fast food restaurants, big name brand stores, gas stations, and chain hotels. Then east of Kennedy Drive to the end of the island is another New Town residential area, again mostly inhabited by locals. The last few blocks at the northern end of the island has large luxurious modern homes with large yards, and across Flagler Avenue along Riviera Drive there are a few private waterfront palatial villas. While New Town may seem a world away from the turn-of-the-century charm of Old Town Key West, it holds a unique fascination as the home of many intriguing and colorful characters making new Key West history. Occasionally homes in New Town can be rented as seasonal vacation rentals. From here you can easily ride your bike to Old Town, but most people drive. Along the extreme southeast shore of Key West are a several European and Caribbean Style resort condominium hotel complexes that make up the Southside resort area. Stylishly built, these lushly landscaped complexes are designed to offer on property amenities such as swimming pools, restaurants, and tennis courts all within walking distance to the beach. 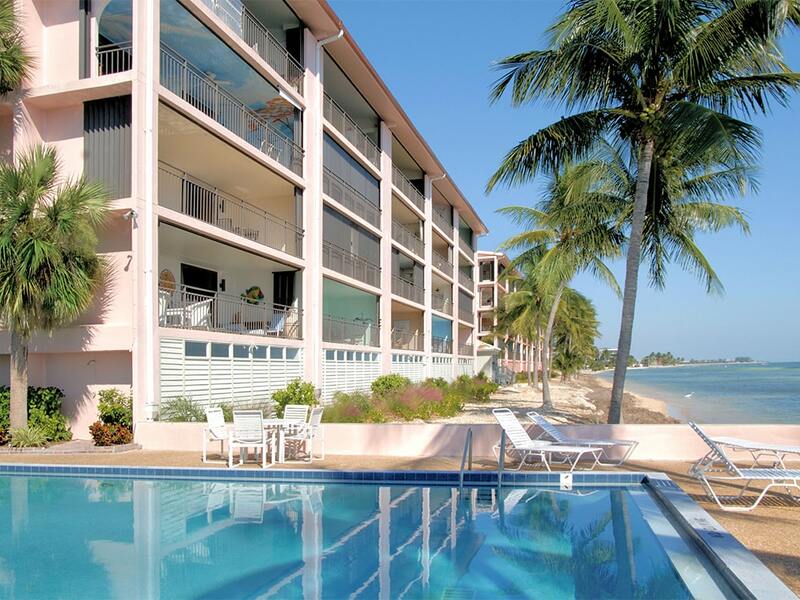 The resort complexes located in this area of Key West are close to the airport and were developed specifically for tourists and often offer luxury amenities at an affordably priced option to Old town. Ride a bike to Old Town District in about 25 to 30 minutes, or take a 10 minute cab ride. This section of Key West begins at the entrance of the island where U.S. Highway 1 jogs north to become North Roosevelt Blvd. A larger development of condominium hotels and time shares has now replaced older chain beachfront motels at the entrance point. A number of newer mid-priced chain hotels dot along North Roosevelt Blvd. on the north parameter of New Town. All the conveniences of New Town shopping centers and chain restaurants make it a convenient and, at some locations, a more affordable rental option. It takes about 10 to 15 minutes to drive to Old Town. A paved path along the water makes it easy to bike or walk and get your exercise while you walk downtown. Just outside the entrance point of Key West on the gulf side of U.S. Highway 1 is the Key West Golf and Country Club Community. Built as a planned gated community this beautiful residential area offers luxury villas and tropical town home residences on an 18 hole 6500 yard Rees Jones design golf course. Some of the residences at the golf course community are available as seasonal or monthly rentals. Just across U.S. Highway 1 on the east side, is the Coral Hammock Condominium Resort Complex that offers private resort condos amidst lush tropical landscaping and a beautiful resort swimming pool. 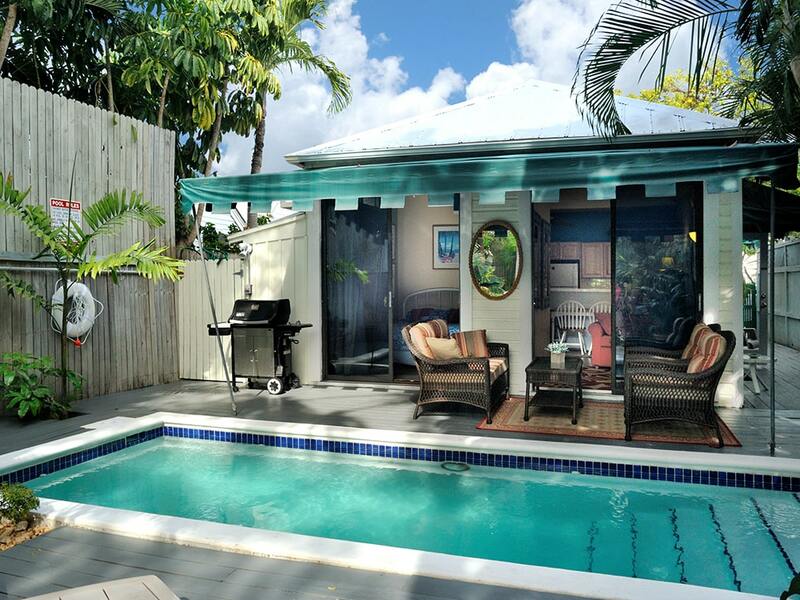 Residences at Coral Hammock are available to rent as shorter term vacation rentals. 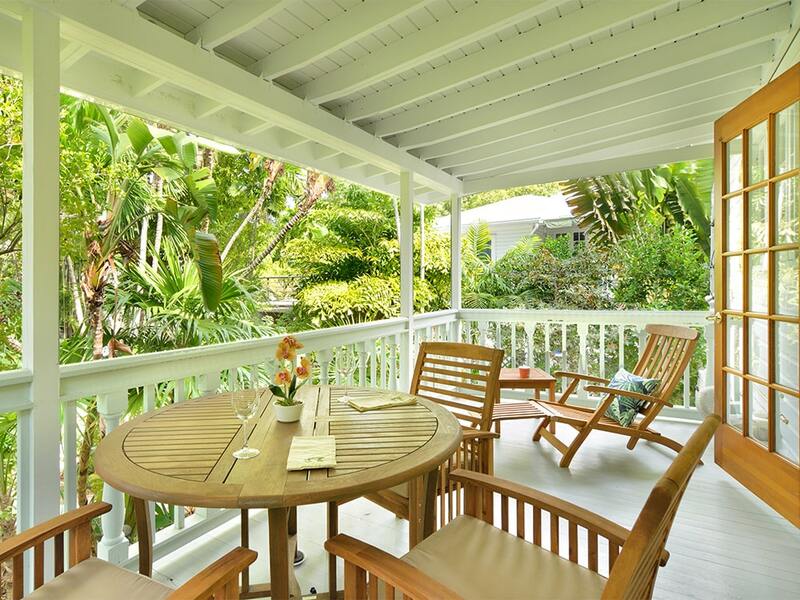 Architecture at both the Golf Course and Coral Hammock locations is Key West "plantation style" with white picket fences, sitting porches and balconies, lush tropical landscaping and traditional tin roofs. Drive into Old Town Key West in about 15 to 20 minutes. Sunset Key is a gorgeous 27 acre private tropical island located approximately 500 yards off-shore from Key West, where the Atlantic Ocean and Gulf of Mexico meet and become your own stunning back yard. Paradise grounds are perfectly manicured with palm trees, tropical flower gardens, white picket fences, narrow brick roads, and from here you'll experience some of the most amazing sunsets you'll see anywhere in the world. 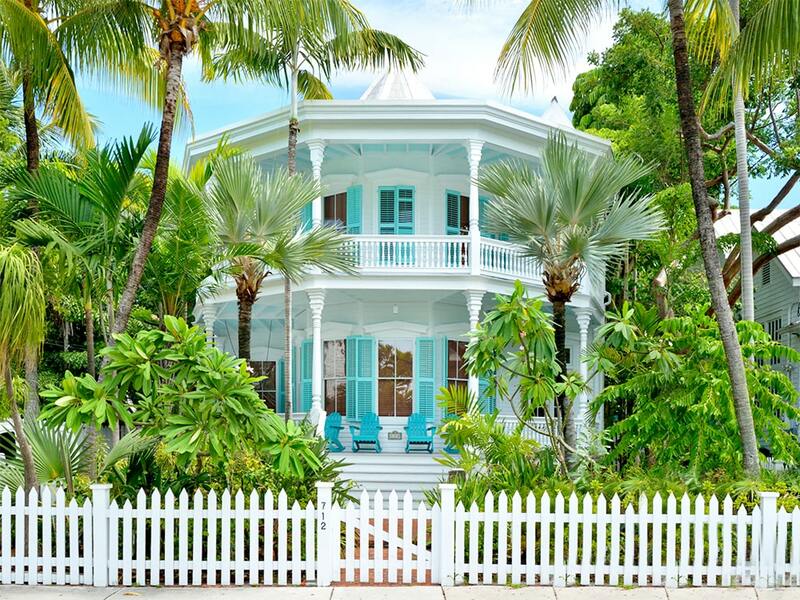 A distinctive collection of elegant luxury island homes and cottages built in classic Key West Victorian architectural style with wide sitting porches, tin roofs, wrap verandas, and white picket fences become your unique neighborhood. Designed for the sophisticated traveler with discerning tastes, Sunset Key is a relaxing and quiet resort island, offering 5 - Star Westin Resort Amenities, where you can leave your stresses and burdens of the 'real world' behind. 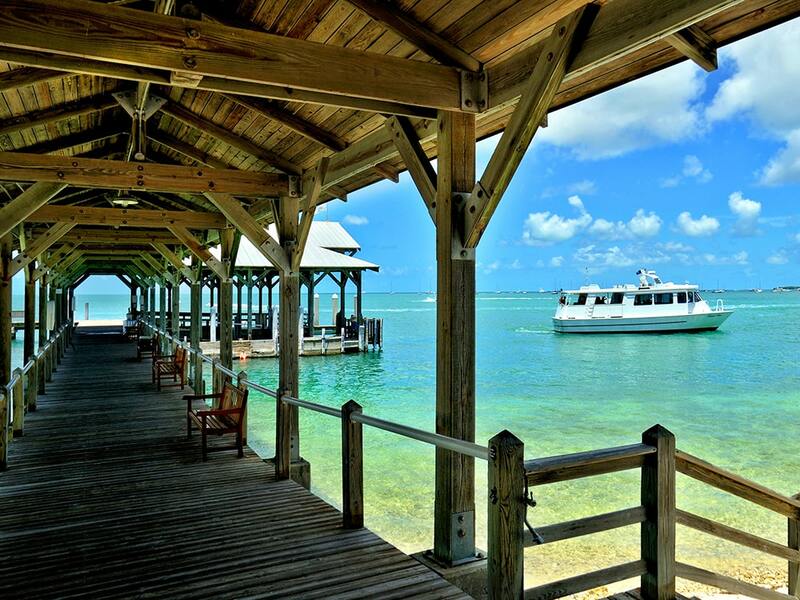 When you're ready to take in the sites and excitement of Key West, you're only a 5 minute ferry ride away. *The City of Key West is divided into six political districts, each lead by an elected City of Key West Commissioner. You can see the City of Key West political district map. While the boundaries of these political districts do frequently overlay with the real estate districts described here, these descriptions are designed to accentuate the unique features mostly relating to architectural styles, neighborhood ambience, and historical interest, and in no way are intended to re-define these political districts.